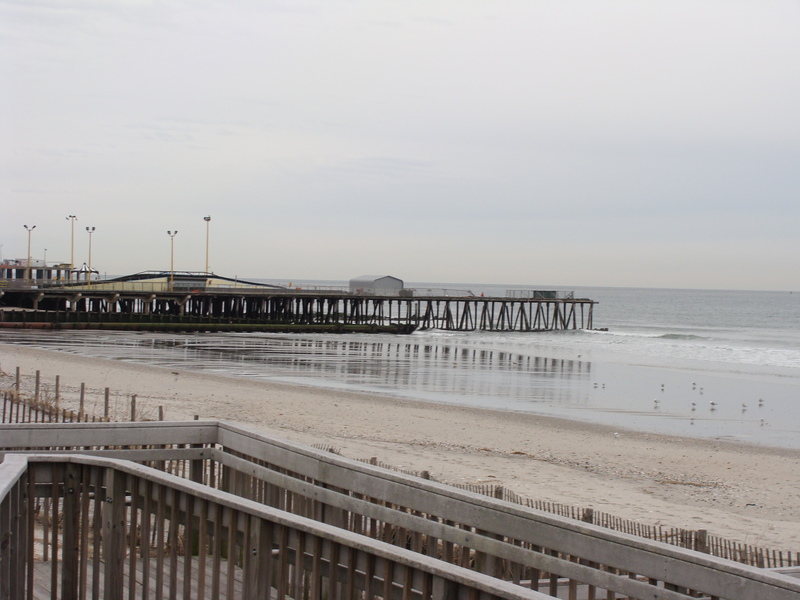 There are portions of Atlantic City that aren’t seen by visitors or even those that live there. Apart from the casinos, it’s a not a town anyone would go visit. There’s corruption in the government and crime on the streets. There are also people who live under the Boardwalk and call it home. I focused most of my photo set on this. Almost every photo has alphabetic text that I incorporated with it. These weren’t captions but supplements to the photos to help make the message clearer. If we look at the pure image of many of the photos, there is too much left to interpretation by the receiver. So what if there is a guy smoking a cigarette on a street corner or a closed supermarket? To get the reader to look deeper and see the message I want them to see, I added alphabetic text (in certain colors and fonts), different tones and captions. Take the pictures of the two homeless men. There are two sentences in each photo. One describes who this man was before he found his way onto the streets. The other is how outsiders view him. The ‘homeless’ stamp is in big, Hollywood-type font and bright colors because it is the initial reaction people have when they see them. The other sentence is smaller because it usually takes people looking harder and deeper to get to the truth. It was important to highlight what I wanted people to look in each photo. The alphabetic text is arguably more important than the photo itself. I wanted people to see how they immediately label situations and how the subjects often time view the situation. In Visual Culture: A Reader, Roland Barthes says, “We are still a civilization of writing, writing and speech continuing to be full terms of the informational structure (p. 38).” The captions accompany the alphabetic text in the photos to explain to the reader what the signifieds are in the image and to avoid everything else in the photo. The very first image in the set has alphabetic text that evokes a different meaning of the pure image. The connotation signifies a warm, cozy place to live, somewhere a person feels comfortable and where they are always welcome. However, the picture – which purposely is hued in sepia tones to convey sadness – is of a place under the Atlantic City Boardwalk. To most of us, this is not a home. The text is to show the dichotomy between the thought of the saying and what is actually pictured. The last photo perhaps was the most striking and had the least work done to it. I didn’t write the alphabetic text. They are handwritten names of dead homeless people. However, it was important to make it this last photo. I showed how some of the homeless lived leading up to this photo, but there is an end to all of them, and often to early. The homeless community is tighter than many realize and the people we walk past daily have names and have people who care about them. I put the photo last because I wanted their life to be shared first before we find out how it all ends. The pictory was also mocked up. This was the original photo taken of the Atlantic City beach. It was a cold, cloudy day and doesn’t evoke a feeling of happiness, summer and wanting to splash in the blue water. I changed the hues of the picture to make the photo more vibrant and have the colors really stand out. Bright colors evoke a feeling of happiness and joy, but one has to wonder why the beach is empty on what looks like a summer day. A place that was once happy and probably full of kids running and laughing is empty, but there are people nearby. The homeless living under the Boardwalk with probably the best view of the ocean. Here’s a link to the entire set and Pictory. It’s easy to think of William Blake as just a poet. His works have been read, scrutinized and studied for centuries. But just calling Blake a poet would be unfair. He understood the importance of multimodality and how telling the same story in different ways could lead to a deeper and more meaningful message. Blake was an artist with words, images, and often, music. According to this article from Canada’s University Affairs, Blake set many of his poems to melodies. In The Marriage of Heaven and Hell, the words can exist without the pictures or the music. There is still meaning to them, but it difficult to imagine how the pictures would exist without the words. Sure, the etchings would be open to amazing interpretation, but the words give the pictures meaning while giving the reader insight into what Blake thought when he wrote this. The pictures also have a way of leaving a lasting impression as opposed to just reading black text on a white page. In Sean Hall’s This Means This, This Means That: A Guide to Semiotics, the prominence section becomes an interesting aspect. There is a list of 31 words separated by a line. One word is highlighted in yellow and another has a strike through. On the next page, Hall asks to recite as many words as you can remember. Usually, the words that are different from others or the words with personal meanings are easily remembered. These words have more prominence than the others. That’s what Blake does with his poems. He adds prominence. The pictures provide the poems personality. One picture could also hit home more than others and therefore become personal to the reader, thus making the poem or just that plate more memorable and effective.